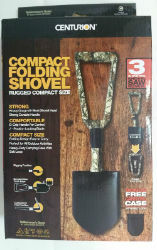 Rugged 3 in 1 folding spade, great for all of your outdoor adventurous, camping, backpacking and gardening too! Made of strong forged steel with Composite D-Grip handle. The shovel measures 23-inch long when unfolded but reduces to a compact size of 10-inch when folded. It is designed with a positive locking collar for added safety. Includes carry case.